The MagnaClean TwinTech offers a dual action filtration system, both magnetic and non-magnetic, meaning that this central heating filter can remove virtually 100% of black iron oxide and non-magnetic particles and debris from your central heating system making it an extremely efficient central heating filter. This central heating filter is part of the MagnaClean Range of magnetic and non-magnetic water filters. The TwinTech central heating filter sets the industrial standard in the delivery of guaranteed central heating system maintenance and protection. 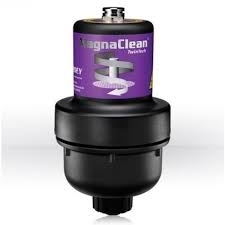 The MagnaClean TwinTech will provide your system with many years of protection. It will maintain the high operational efficiency of the heating system, resulting in increased reliability and the obvious financial benefit.